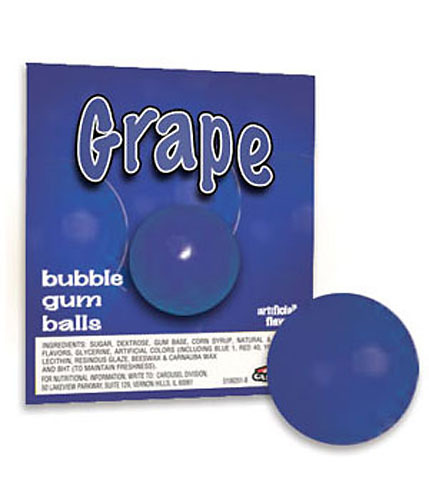 1" Solid Blue Gumballs - 850 ct.
Just Blue for customizing your gumball mixes or candy buffets. Think jeans, clear skies, nautical, and other things that blue reminds you of. Try decorating with gumballs for a quirky and playful touch. Talk about being functional and tasteful at the same time! These gumballs are 1-inch in diameter--the conventional size for commercial vending machines. Need a machine to vend this gum? We have gumball machines of every configuration and any application you can imagine. Make sure to check out our full line of Ford-Carousel Gum for other fun colors and flavors! Made by Ford Gum, these vending machine size bubble gum balls are Kosher-Parve Certified. They typically vend for 25¢. Gumballs store best in a cool, dry, low humidity location. Their shelf life can be up to 18 months if not exposed to extreme hot or cold temperatures.